There are parking meters available on East 6th between Rockwell and Superior (including designated handicapped spaces) and nearby paid parking garages. Cleveland Public Library offers full service at the drive-up window located at the rear of the Louis Stokes Wing on Rockwell Avenue, just west of East 6th Street. Use the drive-up window to check out and return books, magazines, and audio/video recordings–even to sign up for a library card! You can have books and other materials sent to the drive-up window for pick-up by selecting “CLEVELAND Main Drive-Up Window” when placing a reserve in the Library’s online catalog. Otherwise, patrons may phone ahead to any of the Main Library subject departments and request that library materials be sent to the drive-up window (please allot enough time for library staff to bring your materials to the drive-up window). 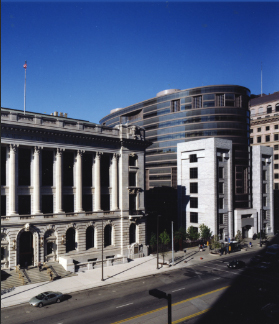 The Main Library in downtown Cleveland consists of the historic Main Library Building built in 1925 and renovated in 1999; the Louis Stokes Wing completed in 1997; and the Eastman Reading Garden located between the two buildings. The two buildings and the garden take up an entire city block on Superior Avenue between East 3rd Street and East 6th Street. The Main Library’s Subject Departments are divided between the two buildings. Cleveland Public Library first opened as a “Public School Library” for the Cleveland Board of Education in 1869. It was the first large public library to allow people to select their own books directly from its bookshelves. For 56 years, the Library was in a series of temporary and rented spaces. In 1925, Main Library opened to the public in a new building designed by the Cleveland architectural firm of Walker & Weeks. The new Main Library proved to be immensely popular: The original estimate of 5,000 daily users was soon eclipsed; by the early 1930s, more than 12,000 individuals walked through the doors every day. By the 1950s, the Main Library’s collection had tripled in size and the Library was short on space. In November 1957, voters approved a $3 million bond issue for the Library to purchase and renovate the six-story building that was the former location of The Plain Dealer. The succeeding decades were difficult times for both Cleveland and its public library system. Increased migration to the suburbs led to a decline in the city’s population and resources. During this time, circulation at the Main Library and its neighborhood branches declined dramatically; from a high of 10,374,652 in 1932 to 3,402,050 in 1970. Funds for the purchase of new books and materials, as well as for the maintenance of library buildings decreased. The last quarter of the 20th century has seen dramatic improvements in the Library’s fortunes. Due to the vision and perseverance of key staff and influential directors, the Library not only reversed its downward trend but became strongly positioned to meet the challenges of the 21st century. In 1975, the library built and renovated neighborhood branches while streamlining the Library’s operations. By 1981, the card catalog was fully computerized. By the late 1980s, after the Library had completed the renovation of its neighborhood branches, attention turned to the Main Library downtown, where outmoded mechanical and electrical systems were posing a hazard to the public, the staff, and the collections. In November 1991, by a 71% majority, voters approved a $90 million bond issue to go forward with a plan for collection preservation, new technology, and renovation. An entirely new downtown building was dedicated on April 12, 1997. With eleven floors, including the lower level, the new 267,000-square-foot building has more than 30 miles of bookshelves–enough for 1.3 million books and is equipped with the latest electronic resources. The new building is named for Cleveland native Louis Stokes, who, in 1968, became the first African-American elected to the U.S. Congress from Ohio. During his illustrious career, Representative Stokes helped found the Congressional Black Caucus, and he became the first black member of the powerful House Appropriations Committee. He was re-elected fourteen times before retiring in 1998. The $24 million renovations of the landmark Main Building called for a sensitivity to the building’s architectural integrity while incorporating new technologies. Electrical, plumbing, and ventilation systems were replaced. Modern fire safety systems, including sprinklers, were installed, and trenches were cut into the cement floors to accommodate wiring for new computer and electrical equipment. New mechanical machinery was placed out of sight in the basement, returning its court to an uncluttered and light-filled state. As part of the architects’ goal of returning the building to its original luster, historic ceiling finishes were restored, the exterior marble was cleaned, historical light fixtures were restored and rewired, decorative metalwork was repaired and polished, and the original leather doors were rejuvenated. For the first time in decades, the Main Building’s historic spaces and architectural details can be fully appreciated, while featuring many technological advances and conveniences. Demonstrating the Library’s continuing support for the visual arts, the Library Board commissioned a substantial collection of permanent art to be included in the buildings and garden. Thirteen artists of local and national reputation created original art for the Main Library, the Louis Stokes Wing and the Eastman Reading Garden. Selected by a jury coordinated with the Committee for Public Art, the artworks are significant additions to the Library’s and the city’s artistic heritage. The new art at the Main Library was made possible largely by generous grants from Cleveland foundations, corporations, and nonprofit groups. Today, the Cleveland Public Library circulates one of the largest and most extensive collections in the country, boasting close to ten million items.